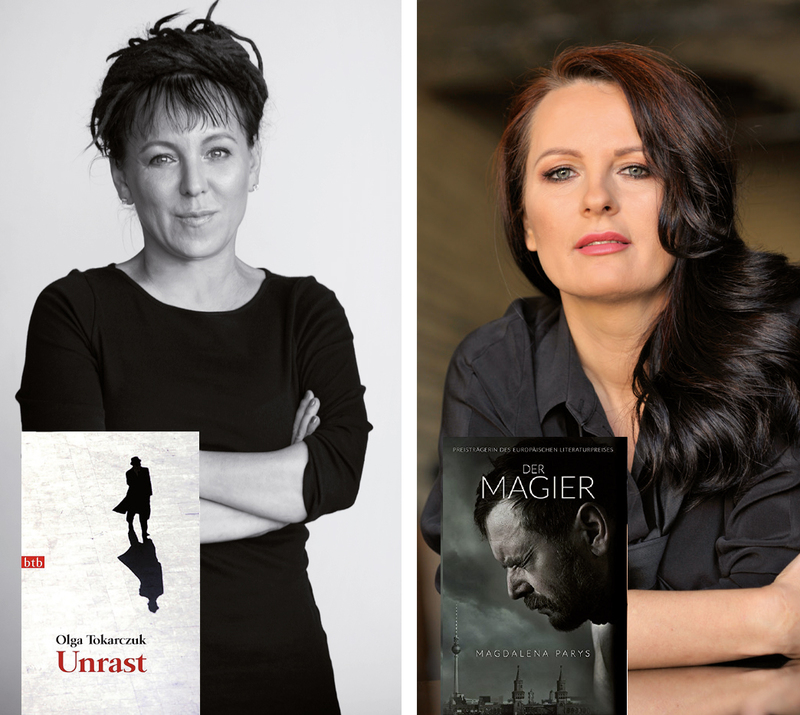 With Olga Tocarczuk and Magdalena Parys the current holder of the Man Booker Prize and the winner of the European Union Prize for Literature are enriching the vielSeitig programme. In May of this year Olga Tocarczuk received the internationally renowned Man Booker Literature Prize for her novel Flights. The bizarre work covers the period from the 17th century to the present time, tells of the Dutch anatomist Verheyen, who dissected his amputated leg, of the heart of the composer Chopin, which after a post-mortem was sent from Paris to Warsaw, and of journeys in the 21st century. The jury praised the “wonderful spirit, the imagination and the literary panache”, but also the irony of the author. Besides Flights she will bring her largest work to date Jacob’s Scriptures to Siegen. 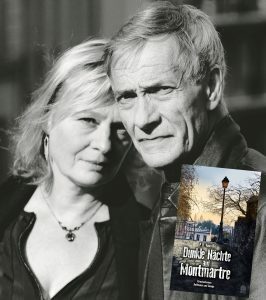 There she describes an unbelievable journey, inspired by true events, across German as well as European history and across the art of book design. Magdalena Parys, born in Poland, has been living in Berlin since childhood. Even though she speaks German as well as her mother-tongue, she writes in Polish. Her political thrillers The Tunnel (2014) and Magician (2018) unfold a panorama which makes the vibrancy of present-day Berlin come to life as well as the past of the Cold War which isn’t over and the period of the “Wende”. Besides the European Union Prize for Literature (2015) she was awarded the prize of French Brittany Prix Littéraire 2018 de la Ville de Quimper. The German reading part will be taken over by actor and voice-over Armin Nufer, the German and Polish language event will be emceed by Dr. Natasha Stelmaszyk, and Brigitte Neitzel will act as interpreter. Enjoy the kosmopolish matinee with a cup of fragrant, freshly roast coffee! Turkey was once regarded as the country of hope: a country uniting West and East, Islamic and at the same time democratic, an example for its neighbouring countries. Not only since the last presidential elections has Turkey become a crisis state which sees itself threatened by enemies from within and from outside, and where democracy and the rule of law have come under serious pressure. Recklessly, President Recep Tayyip Erdoğan has heretics and dissidents persecuted, more and more fervidly he provokes conflicts with neighbours and international partners, not least with Germany. 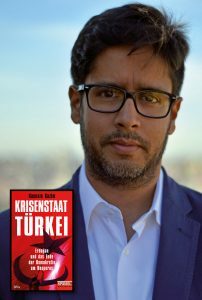 “Spiegel Online” correspondent Hasnain Kazim has experienced first-hand how Turkey has radicalised over the past years. He shows how explosive the situation is in the country and what the end of democracy at the Bosporus means – for Turkey, for the region and for Europe. 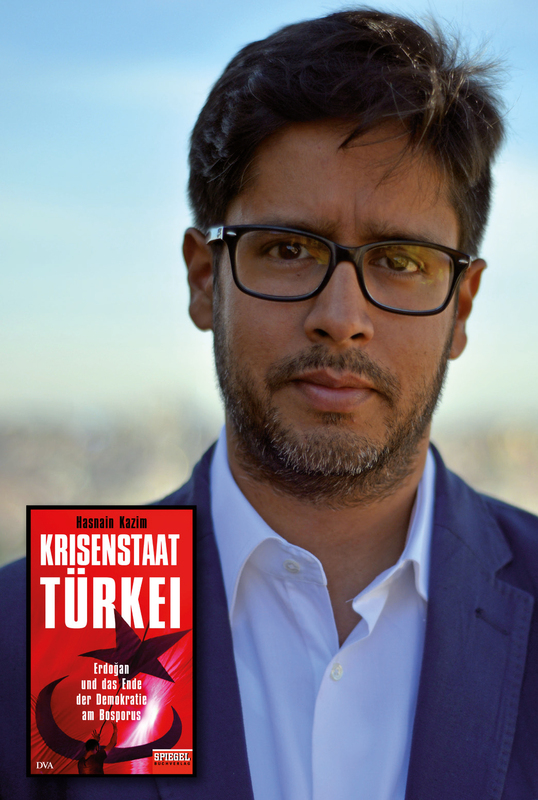 Hasnain Kazim, born in Oldenburg in 1974 as a son of Indian-Pakistani immigrants, has been living abroad as a correspondent since 2009, among other places in Islamabad, Istanbul, and currently in Vienna. Despite all the political and religious extremism that he comes across during his work, he tries to describe also the beautiful and commonplace things. For his reporting he received the award Political Journalist of the Year and the CNN Journalist Award. Syria, 2012: The civil war is raging more and more violently. The pacifist Yasmin runs an underground hospital to care for wounded rebels. In the Freedom Hospital the most diverse paths of life interlace: the French journalist Sophie wants to make a documentary film about the conflict; Dr Fawaz, an Alawite, helps wounded rebels; Zahabiah, the hospital cook, has fled her conservative Sunni family; Dr Yazan is close to the Muslim Brothers, and one of the patients turns out to be a spy for Assad. 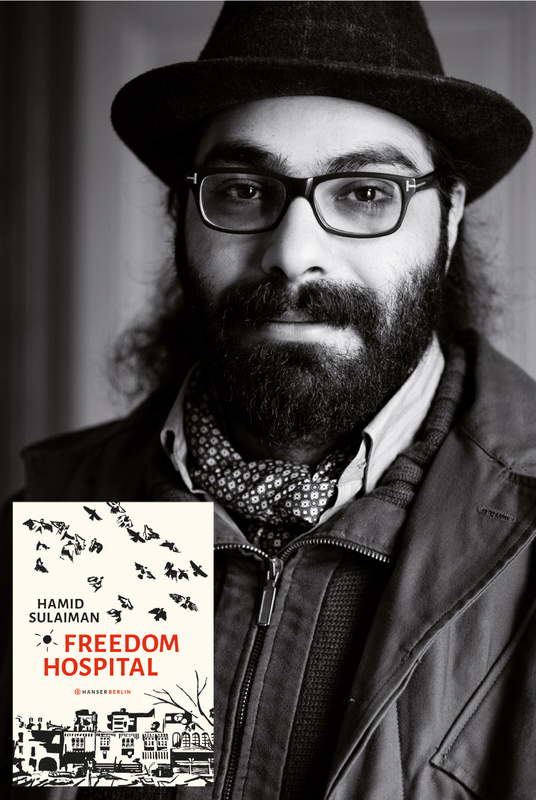 Hamid Sulaiman’s stirring graphic novel with its expressive black-and-white drawings mirrors the complex and torn Syrian society. Born in Damascus in 1986, he studied architecture and worked as a painter and illustrator. In 2011 he flew from Syria and has since been living in Paris. His works have been exhibited internationally and received numerous awards. He presents Freedom Hospital, his first book, in the Museum für Gegenwartskunst, the perfect location to showcase the fusion of literature and modern comic strip into the graphic novel. The event will be in English language with translation into German. Being a child is the greatest adventure. As a child you experience everything for the first time and you have a completely unbiased outlook onto the world. The rainbow grows directly out of the meadow, and the grass, wet from dew, sparkles like a sea of torches. Each blade of grass is topped with a diamond and makes the mole who sticks his head out of his hill immensely rich. Everything is colourful and bright, and everything is possible, at least in your imagination. Do You Remember? Is a tribute to childhood, to the unique moments when you see, smell, feel, do, experience or understand something consciously for the first time – for children and adults. A wonderful story by Zoran Drvenkar with plenty of great pictures by Jutta Bauer. Zoran Drvenkar was born in Croatia in 1967 and lives in Berlin. He works as an independent writer, writing novels, poetry and drama for children, young people and adults. 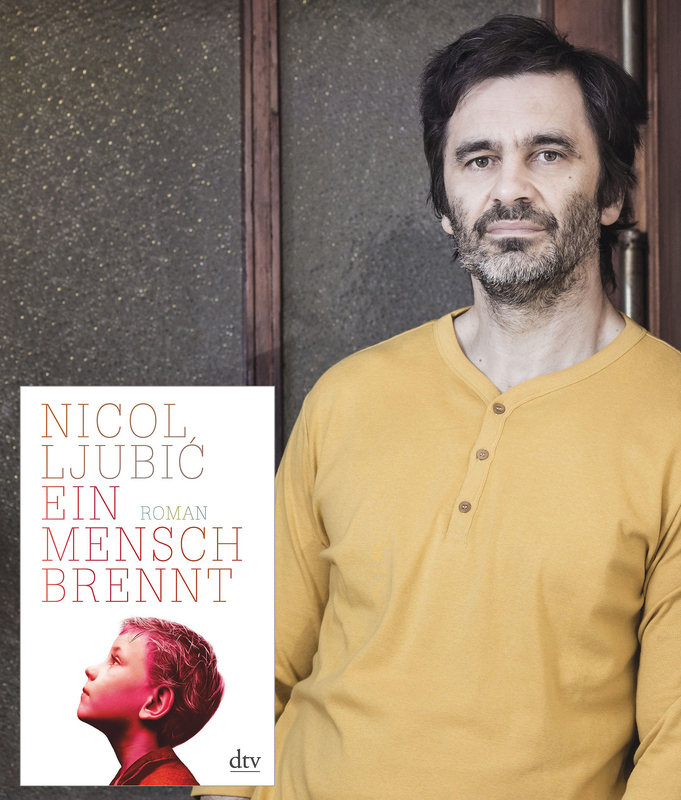 For his books Zoran was awarded, among others, the German Youth Literature Award. Jutta Bauer is one of the most versatile illustrators for picture books and children’s books. She was awarded the German Youth Literature Award for Schreimutter as well as the special award of the German Youth Literature Award for her complete works. In 2010 she received the internationally highest recognition for children’s and youth literature: the Hans Christian Andersen Award. When the idealist Hartmut Gründler moves into the house of the Kelsterberg family in 1975, a new era begins also for 8-year-old Hanno. Instead of playing soccer with his friends his mother recruits him for Hartmut’s fight for a better world – up until his self-immolation. As an adult Hanno wants to finally understand how this fire could destroy his family. A Man is Burning is a masterly narrated novel about the extremely dangerous power of idealism and a childhood between Panini album and pamphlets. Nicol Ljubić, born in Zagreb in 1971, spent his childhood in Greece, Sweden and Russia. He read political sciences and today works as an independent journalist and author. For his reports he received numerous awards. In 2011 he was awarded the Adelbert von Chamisso Promotional Prize for his novel Calm Sea. The event will be emceed by Alida Bremer who in 2016 presented her novel Oliva’s Garden at vielSeitig. In 2018 she was awarded the International Literature Award of the House of the World’s Cultures in Berlin for the translation of Ivana Sajko’s Romantic Novel. Paris in August: The city is baking hot, its inhabitants are fleeing, tourists are crowding Montmartre. It is then that in the Cabaret of Moulin, called the Red, the dead body of a young woman is found. At first glance, it seems to be Daphné, the capricious singer and the only woman in Moulin’s transvestites‘ cabaret. But the dead had only been dressed up as Daphné … Moulin becomes a suspect and entrusts his friend Quentin, really a jazz guitarist who knows the quarter like the back of his hand, to investigate for him. Quentin comes up against a mesh of lies and jealousy: in the Cabaret everybody has got something to hide. Bertina Henrichs lives and works as a writer and film-maker in Paris. Her literary debut The Chess Player (2006) was awarded the Corine – International Book Prize and made into a movie. Philippe Vauvillé is a musician, screen-writer, director, documentary film-maker and singer in the jazz quartet Smoking. In the Café Flocke he will be reading, of course, but he may perform some jazz classics, as well. Elena Ferrante’s novels are bestsellers. The story about the friendship between Lila and Elena, two girls from the slums of Naples, stretches over four volumes. At the beginning, there is the sudden disappearance of 66-year-old Lila. Her worried friend Elena looks back on the many common and divisive events in the lives of the two women which were characterised by prejudices and social and societal circumstances. Elena becomes a writer, her highly-talented friend Lila marries young but manages to struggle to the top and celebrates, in the last volume of the saga, first successes an an entrepreneur, which, however, she has to pay for dearly. The more diverging their life paths turn out, the closer the friendship of the two seems to become. There can hardly be a better choice for this reading in the Lÿz than Eva Matthes. Thanks to her soft but distinctive voice, which easily plays with dialects and accents, at the same time adapting to the age of the two women, she adds emotional depth to the stories about the changing, dramatic, often distressful relationship of the two protagonists. The audience in the Lÿz will no doubt enjoy the brilliant vocal art of Eva Matthes. VVK: 18,- € / AK: 20,- € / erm. : 16,- € / 585 (Ehrenamt, Schüler & Studenten) Freie Platzwahl.